WHY IS ON THE BIT SO DIFFICULT? Check out the training series called 'Retraining the Horse and Rider'. The series is available as a member of DressageTraining.tv where you see variations in the extremes of hollow, and improvements made with horse and rider. We are running this course with multiple horses, view our first pair; Sarah and Pablo's progress here. We show how we went about solving problems in a short space of time using a combination of groundwork, rider biomechanics and school work. 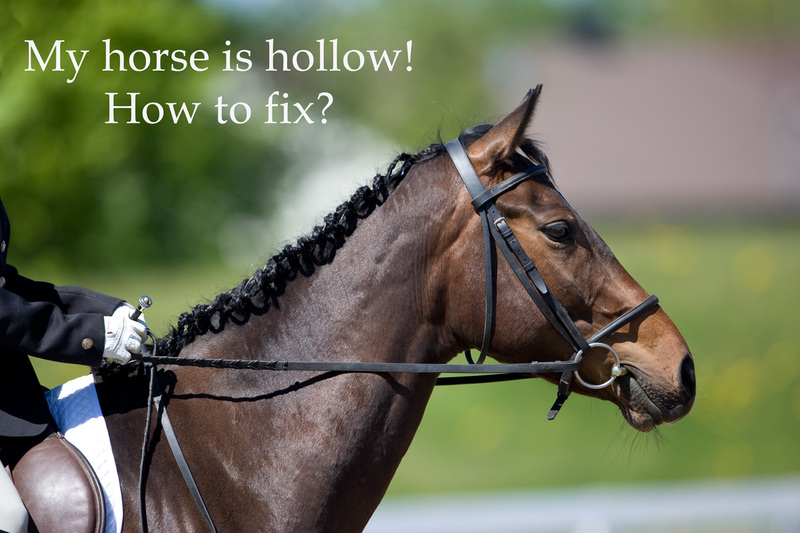 WHY DO I HAVE A HOLLOW HORSE? There are many reasons a horse may be hollow. In general, unless the horse is compromised in some way, a hollow horse can be changed into one which is working over it’s back. This can often happen in a relatively short space of time. Bad back – which includes everything from kissing spine to muscle soreness. Please get your horse thoroughly checked out. Bad teeth – the horse may have sharp teeth, bad teeth, soreness in the mouth etc. Get a good dentist! Bad tack – The saddle may be fitted badly for the horse causing uneven pressure in areas. This can cause the horse to hollow away from the pain of the saddle. A badly fitting bridle, or inappropriate bit can also cause the horse to lift up the head hollowing the back. Bad shoeing/feet – this can cause the horse to be sore on it’s feet and hollow. Rider issues – the rider may be sat too far back in the saddle. They may not be supporting their own weight in the saddle. They may be hanging onto the reins for support, may be too round backed, hollow backed etc. Often there is a bit of a catch 22 in that when the horse hollows the rider’s weight falls straight down into the hollow making the horse hollow more! Horse has an ingrained pattern of movement – this is how your horse moves. The horse may have acquired this movement pattern from poor training/riding. Or maybe this is how your horse thinks he should move. They lengthen their underneath and pull themselves along with their front legs. Horse is externally focused and nervous – If your horse is external focused or naturally nervous then this will cause them to be hollow. They are always head up looking out for potential dangers. First you can get a full check up of your hollow horse using a vet, physio, dentist, saddle fitter etc. This will help identify or eliminate any physical/tack problems. Secondly you can look at the way your horse naturally moves and it’s attitude. Is it lengthening underneath, is it externally focused and nervous? If any of these things are true then you need to focus on your groundwork. 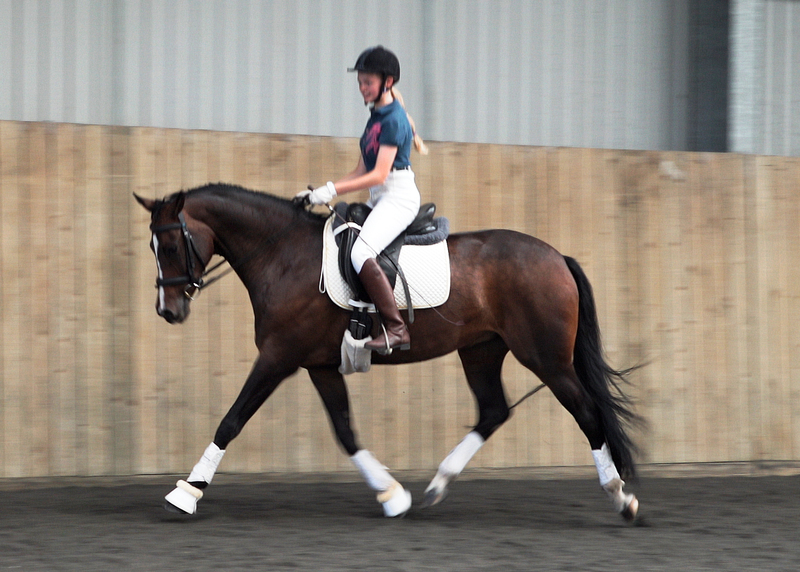 Groundwork will help to teach the horse better movement patterns and to reduce levels of anxiety. Thirdly you can check out your own riding to make sure you are not causing or perpetuating the hollow in the horse’s back. You can find good rider biomechanics coaches at https://dressagetraining.tv/coaches/. 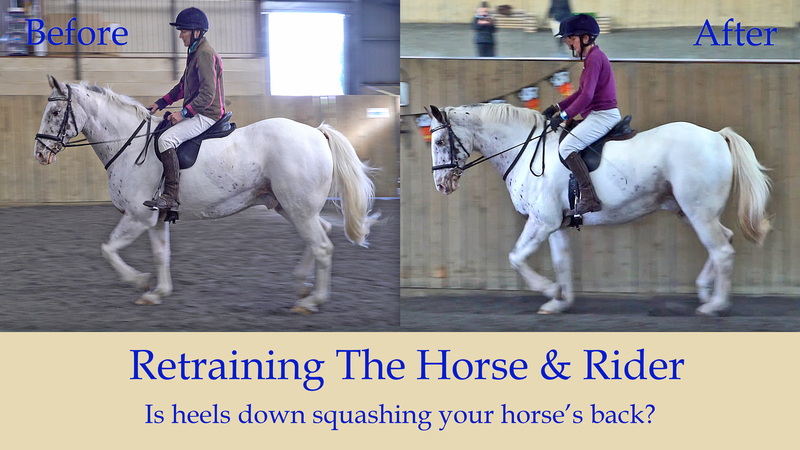 Additionally you should check out our course on how the rider can influence the horse’s back to work more correctly called ‘Rider Biomechanics – Improve the Seat & Gain Influence' which looks at 'On the Bit' or as Mary Wanless prefers; 'The Seeking Reflexes'. WANT TO WATCH THE RETRAINING THE HORSE & RIDER COURSE?